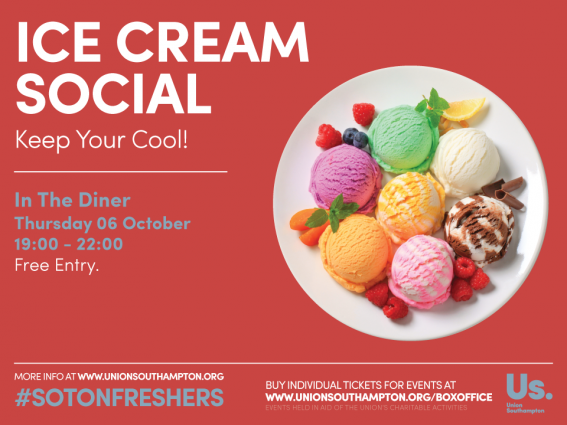 Ice cream and films are some of life’s greatest pleasures, so for Freshers’ this year we thought, why not combine the two and give you a great 1950’s themed night to remember! Everyone enjoys chilling out (see what we did there) and relaxing, so this 1950s inspired night is a great way of having a fun, calm night to help you rest up ready for our other Freshers’ favourites. And for the real cherry on the top – we’re offering this as a free event on us! If you want to attend the event, then there is no need to pre-register, but bear in mind that there is a limited number of seats to see the film, so if you want to get in, be sure to get there early! The event is taking place on Thursday 06 October in The Diner, on Level 3 of the Union building (B42, Highfield campus). If you are planning on coming along to the event, then make sure you join our official Facebook event for all the latest updates and chatter! If this fun and free event appeals to you, then you will love some of our other events that we are putting on, all for free to celebrate Freshers’! Be sure to check out our website calendar at www.unionsouthampton.org/calendar for the whole range of events, including those at Halls Committees and student groups!